It is extremely rare that I get to eat fresh noodles. 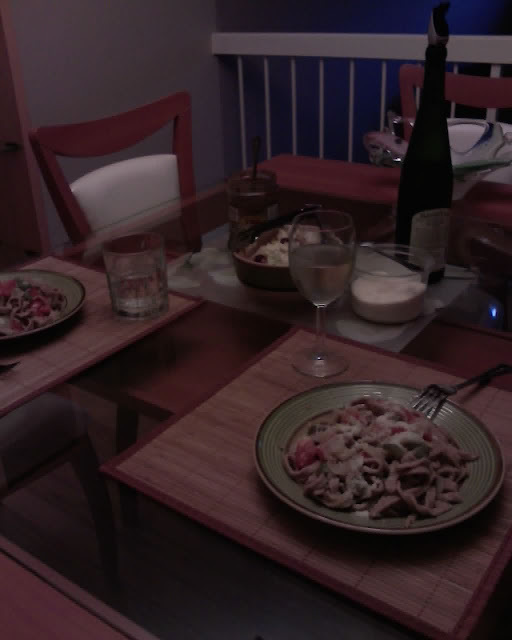 Once about two years ago, "The Ukrainian" and I tried making our own whole-wheat pasta. While it didn't turn out bad, there is a reason we haven't tried again. The dried ones are just... better... and EASIER. The only other times I can recall fresh noodles is the ramen place my sisters took me for my 21st birthday (might do a review at some point) and this one. This place used to be called Bamboodles but recently had a management change and is now called Yu Pin. The ambience was open, clean, and nice. Not too crowded on a Sunday night! I was attracted by the idea of fresh Spinach noodles, so I got this cold version that you're supposed to dip in a thin soy sauce. I didn't get it hot in a broth because I wasn't sure where the broth came from, and the server seemed to have little concept of "no meat." "The Ukrainian" ordered plain noodles in broth with a fried chicken cutlet of some sort. It was lightly breaded with five-spice powder. If you've ever had Taiwanese popcorn chicken, that's what he said this tasted like. I did end up trying some of the broth. It was simple and light. Eating fresh noodles is heavenly -- there IS something different about it. The noodles are tender, yet chewy. "The Ukrainian" also got pork dumplings to go with his order. And I went for these green onion pancakes. They were a bit greasier than I had hoped, but they did taste mighty good dipped in Sriracha!